This was my second attempt at this loaf. Intrigued by David's description of how good it tasted, I just had to give it a try. My first go yielded a flat boule that was very, very sour and quite pale. I let everything go on too long especially the final proof in the fridge. Due to other commitments, it stayed in the fridge for almost 20 hours as opposed to the 12 that David recommended. The second time round I shortened everything. Instead of letting the starters ferment for 14 hours, I gave them 7 which is quite enough for our 30C temperatures we have been having recently. I autolysed for 50 mins and retarded for 12. I pretty much stuck to David's recipe except that I only added 510g of water effectively making this an 80% hydration loaf. If you notice any small discrepancies between the weights of the ingredients in mine and David's recipe it is only because I usually round everything off so it looks neater! I hand kneaded until medium gluten development. Although it was sticky at first, this dough came together surprisingly quickly for an 80% hydration bread. It was easier to handle than the Tartine dough which is only 75% water. Not sure why but guess that it might have something to do with the levain being more acid. It was actually a delight to handle and not the nightmare I imagined. The only reason I reduced the water to 80% was because I was wary of hand kneading such a wet dough. I baked on a baking stone with steam for 15 mins and then uncovered for another 25 minutes. I waited 3 hours before I cut into one of the boules and found the sour quite pronounced but not as sour as my first attempt. Interestingly that sour mellowed out on the second day. It didn't seem quite as sharp. Not sure how that works, either. Perhaps it was just because other flavors were coming through on day 2. Whatever, I definitely preferred the taste on the second day. Will definitely try this loaf again, but think I might try white rye instead of whole rye and shoot for something a little less sour. Having said that, this loaf tastes really great with a mature cheddar. Just bread and cheese. No butter. Very more-ish. Thanks to David for his detailed formula and write up. I'm glad your schedule permitted compensation for the warm temperature this time. I have the levains mixed for another couple loafs tonight. I'll mix, ferment and retard tomorrow and bake Monday. One loaf will be for a potluck Tuesday. Just a little something to go along with the 2 kg SFBI miche I'll also bake for the potluck. It will be what my mother called "Enough too much." Thanks David! And thanks again for your detailed post, without which I wouldn't have made this bread. Already have my eye on Hamelman's Five Grain Levain which you posted about recently. I baked this on Friday so today was day three and the best flavor so far. Ate some an hour ago and still have faint sour taste in my mouth but not nearly as sharp as it was on day one. As I said, I think I will try this one again but use white rye instead of whole rye and perhaps shorten the levain fermentation time to 4 or 5 hours. In the summer my levain is always ready for mixing in 4 hours. In 4 hours my white levain will have quintupled and be at its highest point, will not have started to collapse and will have a wonderful fruity aroma. Rye goes really sour very quickly in these temps. Character building as you say! Syd, you are a more experienced baker than I, but if I were you I would make one change at a time, and since white rye is, according to Hamilton, pretty much lousy flour in terms of taste and nutrition, I'd go for shortening the fermentation first and changing to the flour last. Getting what you want in less time while maintaining the formula would be awesome. You are probably correct there David. It's my impatience showing through. I want it all yesterday and will often coalesce four steps into one and hope that it all turns out okay! I think the first and most obvious step to take would be to reduce the time I let the levain ferment. If I cut it from 7 hours to to 4, I think it would make a big difference in the final sourness of the loaf. I appreciate your comment. Fresh Lofian favorite. Loving the sour as i do, Lucy is betting I would like the taste of your frist, more sour, attempt :-) Amazing how tasty this bread turns out. Amazing really. You have a beautiful example to show us Syd. Just beautiful inside and out. Well Done. Love that scoring too. That first attempt was really sour. Need to go to the dentist on Monday just to make sure it didn't strip the enamel off my teeth! A bit too sour for my liking but the second loaf was much more mellow. What a beautiful loaf of bread! Love the scoring and the colors of the crust. Thanks for your comments. Couldn't agree with what you say about rye more. I felt like such a novice when everything over fermented. It was like, "Duh, I should have known that!" As for the hot weather, the summers here are interminably long. It might sound like fun for a day or two but when you have those temps for 8 months of the year, you would give anything for some snow! Nice bake Syd. Brilliant Crumb. I too agree, although I can't resist cutting it fresh, that this loaf is best after a good 12-24 hour rest. A young levain will do the trick. 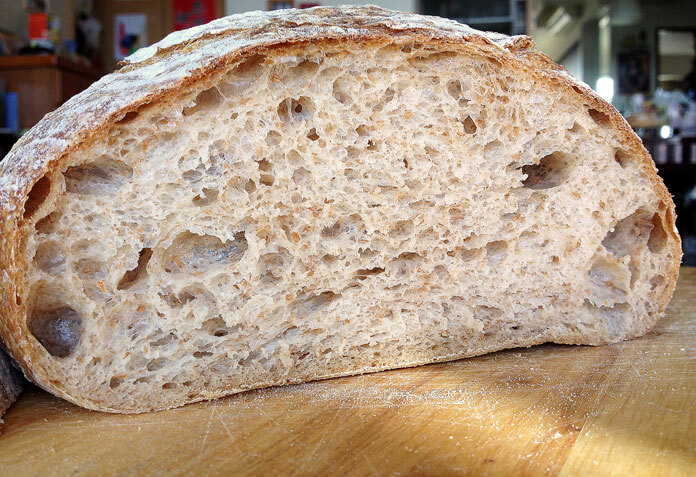 But even further you could split the levain 50/50 white wheat (tartine style) and cut the rye sour entirely. Just add the rye to the final dough. Of course you'll need to adjust your recipe to keep all in check but that should be pretty easy. Then you'll keep all the flavor in balance but decrease the sour tones that this bread certainly has. A bold bake brings a sweetness in the crust to cut across the creamy twangy crumb. That's a great idea about leaving the rye out of the levain altogether. 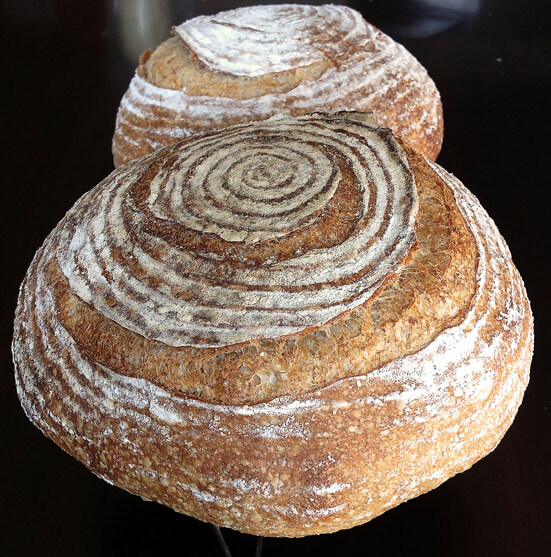 I will try that too, but I might just try the younger levain first. And I know what you mean about a bold bake bringing a sweetness. I could have baked mine a little darker.